Adjustable and overnight briefs for incontinence are also known as adult diapers. Briefs provide superior flexibility and can be custom fitted to an individual's body using the built-in tape or velcro tabs. The tabs and tape also allow the brief to be re-adjusted. 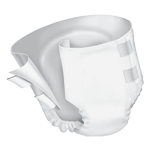 Briefs can be purchased in many absorbencies including overnight protection.